The classic, bright object in the evening Western sky is the planet Venus. However, a number of other objects may also be visible. A remarkable photo taken billions of miles away reveals a tiny dot of light that shines like an incredibly dim star. That speck is Earth, as seen from the Voyager 1 spacecraft 6.4 billion kilometers (4 billion miles) away from us. 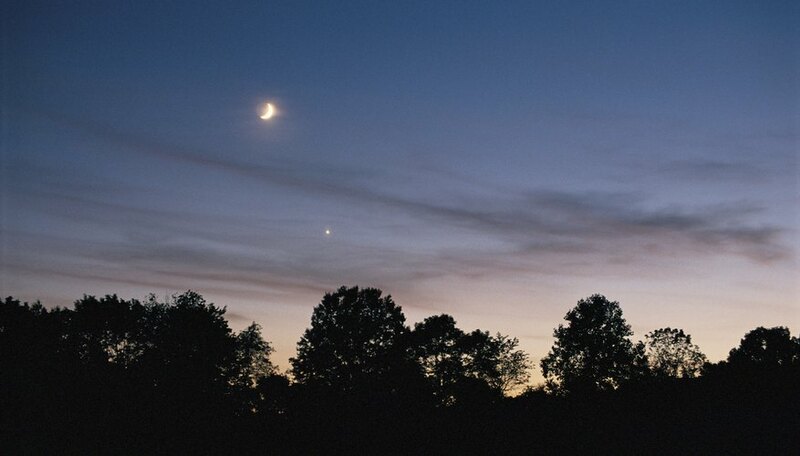 Planets "glow" because they reflect sunlight -- just the way Venus shines brightly in the western sky. Yet, that light, seen around dusk or dawn, doesn't always have to be Venus. It's probably not an alien spacecraft, but it could be a natural or human-made object sparkling in the heavens. View a scale model of the solar system and you'll see that Mercury and Venus orbit closer to the sun than Earth does. Mars and the other planets circle the star at a greater distance. When the sun appears to “set” in the west, you can see sunlight bouncing off Venus because from your perspective, that planet is near the sun. Venus shines so brightly because it has thick clouds that bounce most of the sun's rays into space. Beaming with eager exploratory anticipation, you dash out into the dusk hoping to spot Venus after sunset. That may not happen, because the planet appears before dawn at some times and after dusk at others. The planet's location and appearance depend on where the Earth, sun and Venus are at a particular point in time. Websites such as EarthSky and Space.com offer current monthly sky-gazing tips that can let you know when to look for your favorite planet in the west (links in the Resources section). 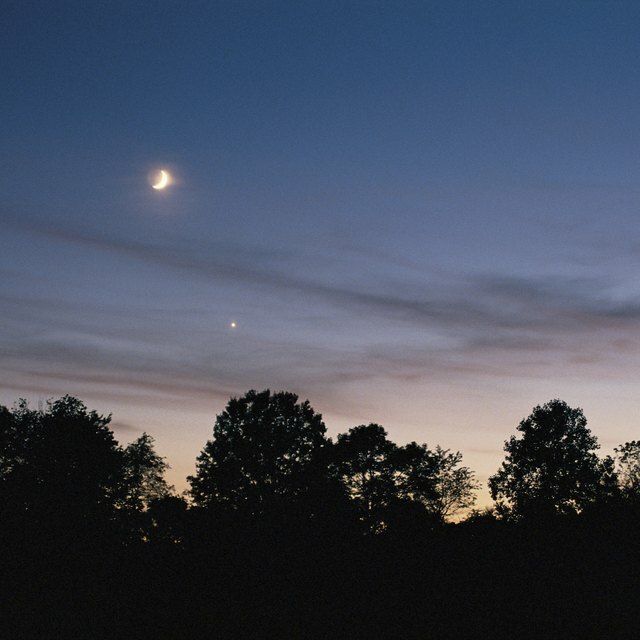 Other planets, such as Mars, Mercury and Jupiter, don't glow as brightly as Venus, but people still spot them in the western sky occasionally. Jupiter can appear more brilliant than any star after it rises in the east and makes its way to the west as the night progresses. Mars, when conditions are right, may also shine about 10 degrees below Venus. On March 11, 2015, Uranus even appeared below Mars. Uranus was 158 times dimmer than Mars.. The sun and its planets reside in the Milky Way galaxy, a massive collection of stars numbering in the billions. Your unaided eyes can see several thousand of them. Aldebaran, a star 35 to 40 times larger than the sun, is the 14th brightest in the heavens and can appear in the west around sunset. The Winter Circle, a ring of bright stars seen on a winter night, rises in the east and eventually appears in the southwest; the circle's right half sets in the west. These celestial events occur at different times depending on when you view them. Consult a star-gazing site for more details. There is an impressive light that moves rather quickly across the sky. The International Space Station, the brightest spacecraft in orbit, makes its appearance in the west and moves towards the east. When this object passes directly overhead, only the moon and Venus surpass it in brilliance. Like the planets, the ISS shines by reflecting light emitted from the sun. Learn when to spot the space station by visiting NASA's Spot the Station website (link in the Resources section). Lee, Kevin. "What Is the Bright Light in the Evening Western Sky?" Sciencing, https://sciencing.com/bright-light-evening-western-sky-5883663.html. 24 April 2017.